An eye-opening account of how the hidden rise of personalization on the Internet is controlling-and limiting-the information we consume. In December 2009, Google began customizing its search results for each user. Instead of giving you the most broadly popular result, Google now tries to predict what you are most likely to click on. According to MoveOn.org board president Eli Pariser, Google’s change in policy is symptomatic of the most significant shift to take place on the Web in recent years-the rise of personalization. 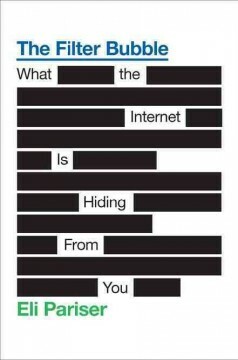 In this groundbreaking investigation of the new hidden Web, Pariser uncovers how this growing trend threatens to control how we consume and share information as a society-and reveals what we can do about it. Though the phenomenon has gone largely undetected until now, personalized filters are sweeping the Web, creating individual universes of information for each of us. Facebook-the primary news source for an increasing number of Americans-prioritizes the links it believes will appeal to you so that if you are a liberal, you can expect to see only progressive links. Even an old-media bastion like The Washington Post devotes the top of its home page to a news feed with the links your Facebook friends are sharing. Behind the scenes a burgeoning industry of data companies is tracking your personal information to sell to advertisers, from your political leanings to the color you painted your living room to the hiking boots you just browsed on Zappos. In a personalized world, we will increasingly be typed and fed only news that is pleasant, familiar, and confirms our beliefs-and because these filters are invisible, we won’t know what is being hidden from us. Our past interests will determine what we are exposed to in the future, leaving less room for the unexpected encounters that spark creativity, innovation, and the democratic exchange of ideas. While we all worry that the Internet is eroding privacy or shrinking our attention spans, Pariser uncovers a more pernicious and far- reaching trend on the Internet and shows how we can- and must-change course. With vivid detail and remarkable scope, The Filter Bubble reveals how personalization undermines the Internet’s original purpose as an open platform for the spread of ideas and could leave us all in an isolated, echoing world.